Introducing a new line of mid-class, high-spec Nikon DX-format cameras. Tokio, September 15, 2010 /PN/ Nikon Corporation is pleased to announce the release of the Nikon D7000, a model that introduces a new line of mid-class Nikon DX-format digital-SLR cameras. The camera is equipped with a new CMOS image sensor and a new image-processing engine, EXPEED 2, that enable capture of high-definition images exhibiting superior image quality. It also offers a number of advanced high-performance features packed into a compact, elegant body. The following lens kit will also be released. The D7000 is a new mid-class DX-format camera with a compact body loaded with a number of advanced functions. As the D-SLR market expands, D-SLR users are becoming more diverse to include those who demand the ability to capture images with greater definition and image quality, those looking for more advanced shooting functions, and those looking for the ability to record movies with the rich power of expression that is only possible with SLR cameras. The D7000 is a high-quality mid-class D-SLR that responds to user demands with a variety of the latest camera technologies and functions for high-quality, high-definition shooting, all in a durable, high-performance, yet compact body. Among its features are a new DX-format CMOS image sensor, Nikon's latest image-processing engine, EXPEED 2, a new 2,016-pixel metering sensor, a new AF system that utilizes 39 focus points, and the D-Movie function that enables recording of full HD movies. 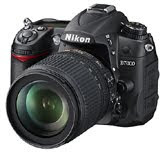 The D7000 is equipped with a new Nikon DX-format CMOS image sensor and a new image-processing engine, EXPEED 2. The camera offers an effective pixel count of 16.2-million pixels and enables capture of high-definition images exhibiting superior image quality with extremely detailed rendering and rich tones with smooth gradations. With standard sensitivity range of ISO100 - 6400 and additional increases up to Hi 2 (ISO 25600 equivalent), the camera offers improved capability with shooting under dim lighting, such as in the evening or indoors, and also expands possibilities for expression with rapidly moving subjects. EXPEED 2 is Nikon's latest image-processing engine developed with the ideas, know-how and technologies regarding digital images that Nikon has cultivated over the years. EXPEED 2 enables faster image processing, a high level of noise reduction, better color reproduction characteristics, and reduced power consumption. With 2,016 pixels, the new metering sensor developed for the D7000 offers twice the metering pixels as our previous high-end metering sensor. Prior to shooting, the 2,016-pixel RGB sensor acquires accurate information regarding the scene. That information is then reflected in autofocusing, automatic exposure, i-TTL balanced fill-flash, and auto white balance control for extremely faithful images. Adoption of the new Multi-CAM4800DX autofocus sensor module enables certain acquisition and tracking of the intended subject with 39 focus points. Nine cross-type sensors at the most frequently used center of the frame allow for certain acquisition of the intended subject. In addition, the number of active focus points can also be limited to 11. The D7000 is equipped with the D-Movie function that enables recording of high-definition movies (1920 × 1080p, 24 fps) exhibiting superior video quality. Autofocusing during movie recording is possible using contrast-detect AF. When the focus mode is set to Full time-servo AF (AF-F) and the AF-area mode to Subject-tracking AF, the camera automatically maintains focus on a subject moving throughout the frame in three dimensions. The D7000 also offers in-camera movie editing functions that allow users to save a single frame as a still JPEG image or delete unnecessary portions from the beginning or end of movie files. Recording of stereo sound via an external microphone is also supported. Unless otherwise stated, all figures are for a camera with a fully-charged battery operating at an ambient temperature of 20°C (68°F). ofcourse every one is sharing data, that's genuinely fine, keep up writing. Greate article. Keep posting such knd of information on your blog. tο glaring balance and play deficiencies. "Arche - Age fir and Eagle", also tells tɦe story off this history, tells thе story of twelve youn herro growing period, tthe story օff the struggle. I'm still neew tto everything. Do you have any tips for newbie blog writers? is the best waay tto change, maay youu be rich and continue to guide others.